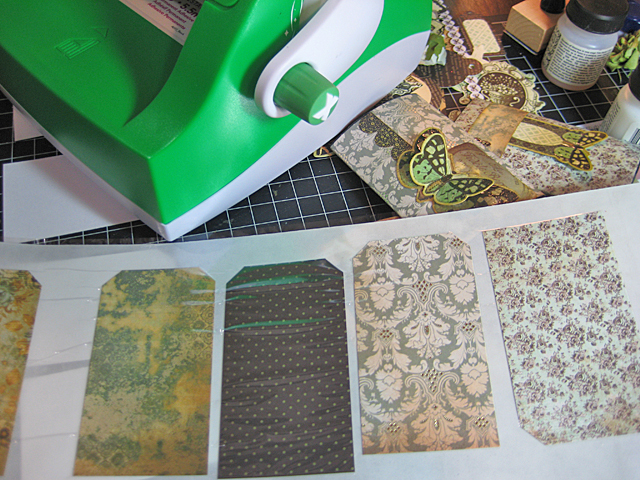 As you may already know, I’m participating in a Blog Hop this week with Xyron and Kaisercraft. I received beautiful papers and embellies from Kaisercraft’s 75 Cents collection and I’m in love! The papers are so pretty and delicate-looking and the shades of blue mixed with light golds, greens and black just really inspired me for several projects. This is the final project for the Hop but I’m sure you’ll be seeing me use this collection again. 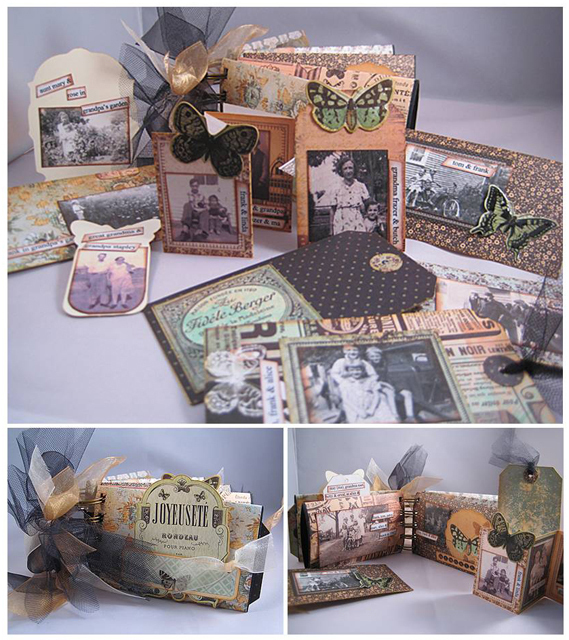 I want to try a few more tags and maybe some cards and I think it would come together nicely for a cd mini book. 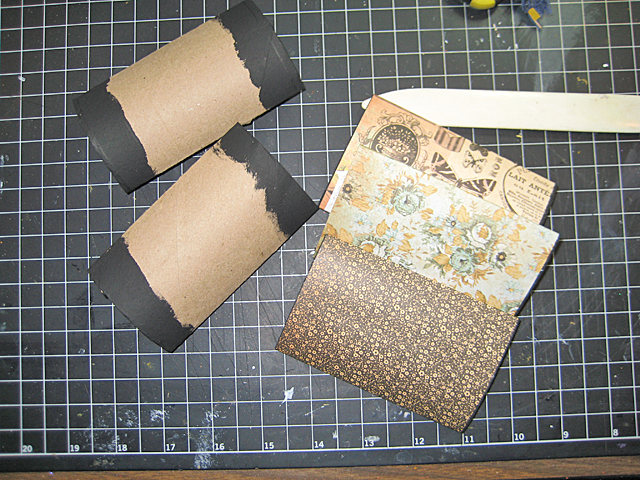 This project is a small pocket-page mini book made from toilet paper rolls. I started by gathering five rolls all the same size and flattening the rolls before painting the ends with Adirondack Pitch Black Paint Dabber. Kaisercraft 75 Cents collection 6 1/2-inch by 6 1/2-inch paper pad and empty tubes. Excuse this next step because I was so excited to see the paper on the painted tubes that I totally forgot to take photos! But here’s what I did: I cut the paper a hair under the width of the tubes and processed them through my Xyron 9″ Creative Station side-by-side and face-up. This puts a solid coating of permanent adhesive on the paper backing. Peel the protective cellophane from the top and peel the tacky paper from the backing – one sheet at a time. Lay the paper down – tacky side up – and place the tube in the middle; wrap the paper around the tube. You’ll have about a 1/2 inch of so of overlap which is perfect! Flatten again with a bone folder. Painted tubes (left); 75 Cents papers adhered to tubes with Xyron 9″ Creative Station (right). Once all tubes are wrapped it’s time to remember to punch your binding holes. I use the Zutter Bind-it-All so really try to remember to punch my slots early on in the project before I start adding embellishments. As you can see below – I forgot once again – it’s the excitement of a project coming together, I just forget! 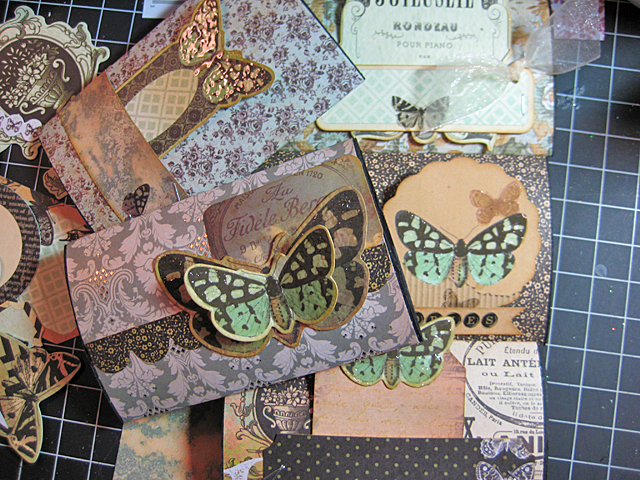 I used the Kaisercraft 75 Cents Collectables for embellishing. 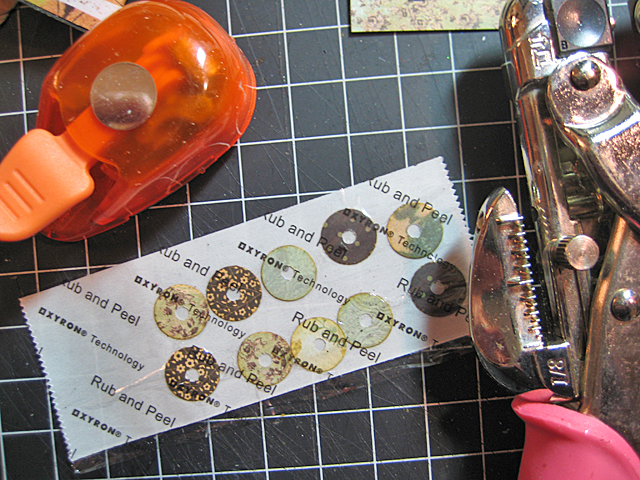 The pack is chock full of assorted die-cuts for embellishing. All the edges are inked with Vintage Photo Distress Ink and some are heat embossed with the Perfect Medium Pen and UTEE technique from the Round Shadow Frame. Book pages decorated with 75 Cents from Kaisercraft, Xyron 9″ Creative Station and Xyron Glue Stick. 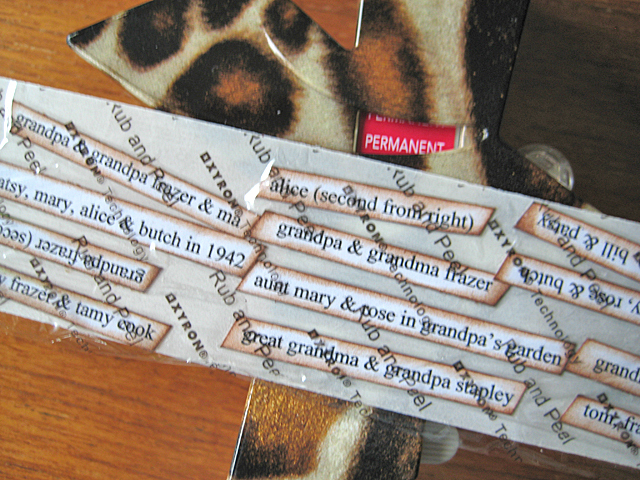 I made tags to slide in the tube pages by cutting rectangles that easily slide in and out from more of the papers. The upper corners are trimmed out to look like a shipping tag then processed through my Xyron 5″ Creative Station and stuck back-to-back to create the tag. Handmade paper tags processed through Xyron 5″ Creative Station. I like to make my own reinforcers so they match the tags. A 1/2-inch circle punch and Crop-a-Dile, combined with Xyron 1.5″ Create a Sticker are perfect for this part. Easily make your own reinforcers to match your project; Xyron 1.5″ Create-a-Sticker and punches. I’ve had people tell me this book is too small for photos so wanted to add photos to show how it’s a great size for photos. I located photos I wanted to use on my computer and resized them to fit the pages and tags. 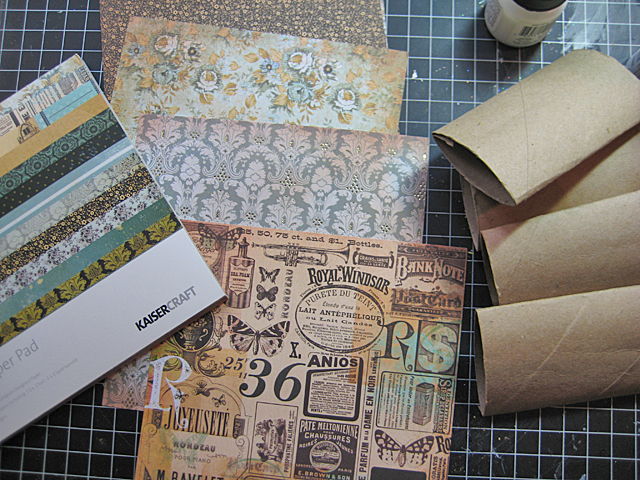 They’re all printed out on matte photo paper, trimmed and edged with Vintage Photo and Walnut Stain Distress Inks. Then I simply run them through my Xyron for full coverage. I determine which Xyron to use by the amount of photos I will be using. I had a lot of photos for this book so ran them face-up through my Xyron 5″ Creative Station. I just pack them in nice and tight and it uses very little adhesive. I’ve calculated the price out before and have discovered even at full price it only costs about $1 per foot of adhesive to use my Xyron which gives me a nice clean way to adhere papers and photos. My fingers don’t get all gooped up and my projects remain sticky, messy-free and I don’t have to wait for dry time. 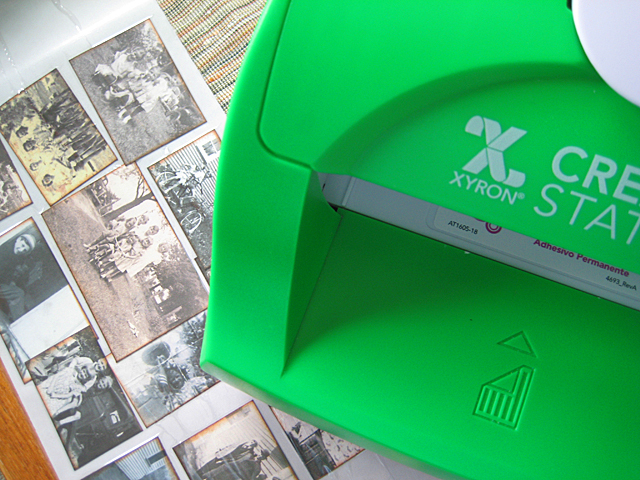 Sized-to-fit photos processed through Xyron 5″ Creative Station for full coverage. I also like to make my own captions for my little books so write and print them out on ivory cardstock. I trim them out, ink the edges and again run through one of my Xyron machines. These captions fit perfectly through my Xyron 1.5″ Create-a-Sticker. I love the fact that I can adhere over the photo if I want or anywhere on the page and that they are personalized. I can also make the font fit the theme and style of book. Create your own photo caption stickers by printing and running through Xyron 1.5″ Create-a-Sticker. This book just turned out so much nicer than I anticipated and it would make a lovely family gift, but I may just have to keep this one for myself! Be sure to visit Xyron’s blog to check out projects by the other design team members as well. Check my calendar to see where this class is being taught. Thank you Julie! I really enjoy making them. Great idea. This is small enough to keep in purse for show-and-tell. And it’s so fancy that you would want to show it off even if the people don’t want to see your pictures. What a nice album! And a great way to recycle, too! Those papers look gorgeous! Love what you’ve done here, especially making your own tag reinforcers. Thank you Marjie, I really love the 75 Cents collection. the colors are beautiful.